Yenda Cenotaph commemorates those who served in World War One. The memorial had three Lee Enfield rifles pointing skywards joining at the end to form a triangle. (Originally Martini action rifles were on top but disappeared). These rifles have been replaced with a rifle and helmet encased in perspex. The central column is surrounded by four pillars linked with a heavy chain and accompanying flag poles. The column and pillars are all formed in concrete. The main column, copper plate with insignia and wording was designed and fabricated by Charles Spencer a local coppersmith. 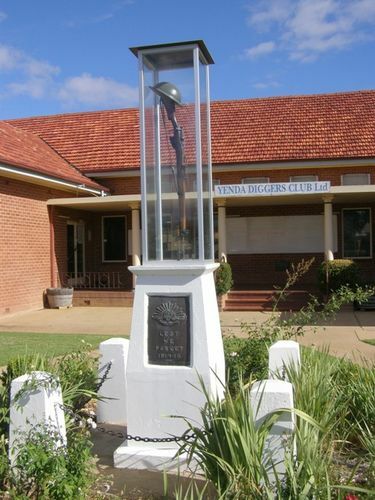 The memorial was originally in front of the old RSL Club but was moved when the RSL Club sold the building and land for new premises some 100 metres east of where it now resides at the Yenda Diggers Club.